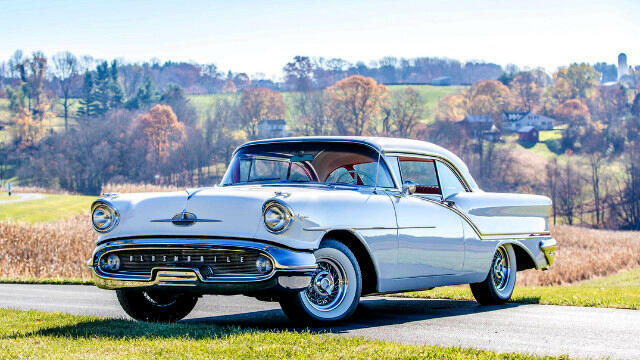 Having undergone a ground-up rotisserie restoration including a comprehensive engine and transmission rebuild completed by J.B.s Auto Machine in Baltimore, Maryland, this 1957 Oldsmobile Super 88 boasts the NASCAR-busting J-2 371/300 HP V-8 engine fed by three 2-barrel carburetors. The J-2 Tri-Power set up put Oldsmobile on the racing map in 1957 and 1958, literally pitting Oldsmobile squarely against the feared and revered Chrysler Hemi-powered cars. Part of the genius behind the J-2 Tri-Power setup was the manner in which the carbs fed the engine. Under normal throttle, the center carburetor powered the car, the 371 producing roughly 270 HP; but under more urgent acceleration, the other two carbs would open up and turn the otherwise elegant and conservative Oldsmobile into a mile-eating monster that made other like-engineered cars take a step back with a 300 HP punch. It wasnt long before NASCAR outlawed multiple carburetion in racing, thus sending cars like the J-2 and Chrysler Hemi searching for answers, but in the meantime, Oldsmobile set a few records that surprised racing fans and car enthusiasts alike and brought drivers like Lee Petty to the Oldsmobile camp from Dodge. While the J-2 did a lot for Oldsmobiles image, only about 2,500 were produced with the J-2 option between 1957 and 58. This one is complete with an automatic transmission and power steering, and is presented in white with red accent striping outside, with a beautiful Tri-Tone colored interior of red, black and white, reupholstered with the correct fabric during the restoration. The AM radio has been upgraded with an FM conversion and the car is well dressed including dual chrome side-view mirrors, wide whitewall tires, tinted glass and exquisite chrome wire wheels with spinner hub caps. Oldsmobile has long been known as the quietly conservative but muscular division of General Motors, and the J-2 is one of the originals that helped it achieve that status.